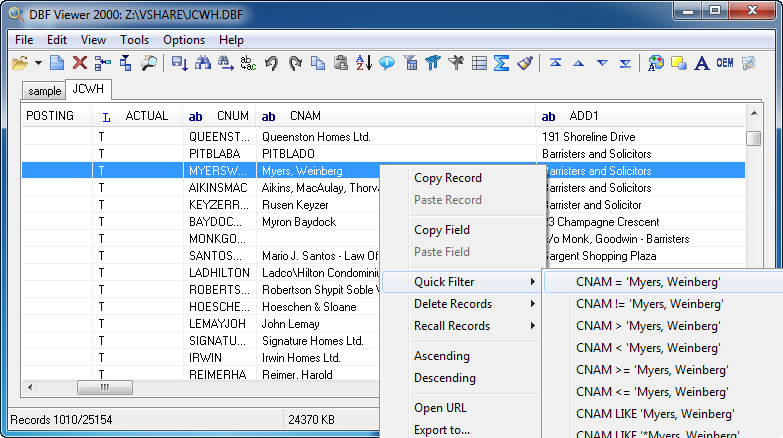 The Quick Filter option available in DBF Viewer 2000 allows you locating records in a database that match certain criteria, almost instantly. This provides additional convenience when you work with a huge dataset and saves a lot of time when you deal with groups of records that have similar values of one or more fields. Imagine the following scenario. You have a database of orders where you want to quickly see all orders except orders for a given product. Then you want orders placed before a given date. Then you want to display every order received in a given department and so on. Quick Filter ideally handles such situations. The option allows you to quickly apply predefined filters to the selected field and instantly see the matching records. We assume you are already accustomed with that DBF Viewer 2000 interface. Open a DBF table. Right-click a certain value in the table view. This will bring up a context menu as shown above. Hover the mouse over the Quick Filter item to display the submenu. These are quick filter options you can immediately apply to the selected field to filter out the records by this field.